Have you gotten so stuck with blogging you feel like giving up on it? Here are 5 ways to get going again! Today’s focus is on photography blogs, especially the top 5 reasons why so many photographers seem to get stuck with this aspect of their marketing. This has been a big topic of conversation lately in my coaching calls and, while most photographers understand the need for a blog, there are some definite roadblocks getting in the way. In fact, some of the photographers I’ve talked to told me they got so stuck they gave up entirely on their blogs, and tried to focus on other forms of marketing instead. For example, they hoped to see more success with Facebook, but it’s still not working out for them in the form of new business. Which leads to a great deal of frustration about getting their photography noticed by the right people. And, of course, without the attention of targeted prospects, the chances of generating new leads for the business are slim. Even though I’ve talked a lot about the vital role photography blogs play in your marketing, it can’t be overstated. The static elements of your website are there to help convey the “what” and “how” of your photography business, such as on the home page, about page, service pages, and visitor resource pages. Those static pages are also the main focus of your SEO efforts, for example, landing pages aimed to attract visitors for a specific keyword phrase. The website represents the nuts and bolts of your photography business. So far so good, and a basic website with no blog might work for a long-established photographer who’s already well known in their community, but it can come across as a bit soulless when you have to rely heavily on making meaningful connections with new people who may have never heard of you before. This is where a blog becomes critical to the success of your marketing and lead-generation. A blog adds the power of your personality, voice, and creative artistry to the website, and it provides a window, if you like, into your photographic world through which people can get to know you better. As those people learn more about who you are and your photographic journey, they naturally start to like you, which ultimately leads to the most valuable asset we have in the world of marketing and human connections. The whole process of lead-generation is based on how much people trust you to be (at least potentially) the right photographer for them at the time they need to hire someone. And, the more often you blog, and the more topics you blog about, the more opportunities you give your ideal clients to learn more about you. Of course, I’m not suggesting you blog every day, but once per week should be more than enough. Sounds great in principle, doesn’t it? But, for most photographers, it’s a lot easier said than done and feels more than a bit daunting. So daunting, in fact, that a lot of folks don’t even get started. But Aren’t Blogs Only Good For SEO? Okay, but I know you might already be thinking that no one ever reads blogs, or that photography blogs are only good for one thing, which is SEO (search engine optimization). I can understand why you might think that way about photography blogs. After all, photographers have kind of gotten used to the idea that people don’t read what they write, and there’s been a lot of talk in the past about blogs existing just for SEO, so I get where these ideas come from. However, those ideas are not only false, they will cripple your marketing if you allow them to control what you do. The generally-accepted idea has been Google loves blogs and so rewards them with higher rankings, which is true – for SOME blogs (those with a very wide reach, and a lot of keywords to target). But, SEO for photographers is different because you have such a limited range of keywords to target, meaning that using blog posts for SEO is pretty much a waste of time, and it ends up confusing Google more than helping them to rank you better. The real answer is to use static pages (filled with valuable and helpful content) on your website to target specific keywords and then point links to those pages from your blog posts to help those pages rank better. But, spending a lot of time on SEO for individual regular blog posts no longer works the way it did a couple of years ago. Regarding the writing aspect, people will be more likely to do business with you because they’ve gotten to know, like, and trust you. However, photography does not sell itself, and we really need to tell the stories of those photographs in actual words. This is how you connect and engage with people in real and meaningful ways and helps move them closer to the point of hiring you. If you write a blog using your distinct personality and voice, and you do so in a genuine way that demonstrates to prospects why you do what you, and why you’re the right photographer for them, then you start making a REAL impact that results in more leads for your business. The first roadblock is a real blog-wrecker. 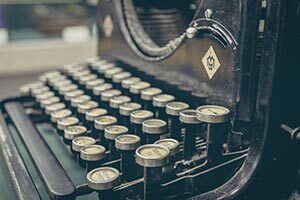 One of the big myths keeping photographers from even starting a blog in the first place is the idea that we need to have excellent writing skills. But the truth is, writing for the web is a LOT different from the process of writing a novel, a formal report, or an essay. This is a blog we’re talking about here, not an attempt at winning a major journalism award, but I guess we all have a tendency to flash back to the horrors of having to write properly, which our English teachers tried to hammer into our skulls at school. No wonder photographers break into a cold sweat at the mere thought of having to write a blog. Then there’s the barrier of being “visually-minded” people. You create photographs for a living – images you hope will tell the story for you without having to resort to using actual words, because then you’d have to deal with sentences, paragraphs, and grammar. Why not be a rebel, and throw those things out the window? Go on, I promise not to tell your English teacher. The great news is, you don’t need to worry about proper paragraph structure and many of the other so-called rules of writing because people don’t read the web in the same way they read a novel or business book. Simply take a look at your own reading habits. Do you inwardly critique every post you read for grammar, or get mad when you see paragraphs with just one sentence of only three words? Obviously, correct spelling is important, and you do have to edit and craft your words to infuse them with your own voice and personality, but that’s as much as you need to worry about. Remember too, while your photographs are immensely valuable, the words you use to tell the stories in those images are even more valuable. So, it’s perfectly okay to cast off the fear of having to be a writer in order to blog. Having overcome the pressure to feel like a real writer, there’s still the issue of not feeling good with words, and the fear of not being able to communicate what you want to say in the right way. I’m not sure where this problem originates from, but perhaps it has something to do with trying to project an impression of being smart or clever when it comes to choosing impressive words. The key thing about writing a blog is for your posts to feel conversational, informal, and full of personality. You want your reader to feel as if she’s sitting right there with you, captivated by the story you’re telling, because a blog post is essentially a conversation – albeit your side of the discussion, but a conversation nonetheless. Think about your real-world conversations for a moment. Do you tell stories using your normal vocabulary, or do you try to make them sound more impressive with fancy language? You probably keep it natural, right? 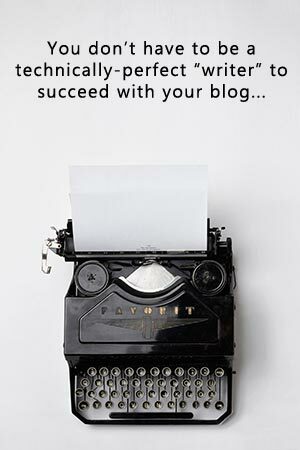 Your blog posts should be the same. No need for flowery embellishments or fancy words used purely for the sake of it – those things only get in the way of your story and can make your reader see you as being somewhat aloof. To overcome this hurdle of struggling to find the right words, all you need to do is relax and write from the heart. Not only will your blog posts sound more natural, your true passion for what you do will shine from every sentence. People will respond much better to what you have to say and, from there, be much more likely to become a valuable lead for your business. So you’ve gotten past the need to be a formal writer, and thrown the temptation to impress with fancy words out the window, but it’s not long before you run into the next wall. You get stuck for ideas, paralyzed by a lack of inspiration, and scared you’re going to churn out yet another of those boring posts about your latest photography session and how much fun everyone had. The reality is, there are so many other things you can document on your photography blog. I was talking with one of my coaching members the other day who was stuck for blog post ideas. She then went on to ask how she could better promote some mini-sessions she was offering to support an upcoming half-marathon she’s running for a charity. Never having run a half-marathon before, she’s obviously involved in rigorous training in order to be properly prepared. Posts that take her readers and target clients along on her journey to completing the run, while exposing them at the same time to opportunities for them to support her efforts through her mini-sessions, the profits of which are being donated to the charity organizing the event. The lesson here is to open your horizons as wide as possible with regard to blogging topics. 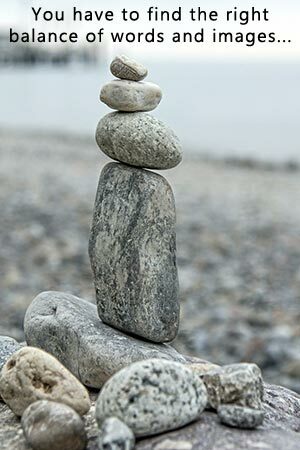 Anything that involves your photographic journey as a photographer or artist is fair game, as are topics connected with life in your community. And don’t forget the things your ideal clients are interested in around the topic of your specialized subject, but outside the actual photography itself. For example, consider the hot issues and topics faced by parents of small children, engaged couples, pet owners, commercial art directors, or whomever your chosen audience is. Having identified new topics for your blog, you’ve already come a long way to putting your blog to work for you, so you sit down to start writing your next post only to run headlong into yet another unexpected hurdle. How are you going to make yourself and your topic sound interesting? If you stop to think about this too much, you run the risk of stopping altogether as a result of the seemingly-real conviction of feeling 100% uninteresting to people other than your immediate family. Okay, so you haven’t been to the moon, flown around the world, traveled to the bottom of the ocean, altered the course of history, or changed the balance of national power. Few people, indeed, have done those things. But you don’t have to in order to be truly interesting to your ideal clients. The source of your fascination for your prospects is in the magic you perform when creating the photographs you produce for them. Those are the factors that make you interesting to others. You’re a magician, working your magic through your eye, lens and camera. But, do be careful about revealing too much of how it’s done because once people know that, it’s no longer magic, is it? Wow, we’re almost there, but the last mile of any journey always seems the longest, doesn’t it? Even though you’ve gotten in closer touch with your real source of fascination, you still have to fill up your blog posts with something, and the temptation is always to throw as many photographs in there as you can. After all, it comes right back to you being a photographer – a visual person – and the false hope that great photography sells itself. I’ve seen photographers use all kinds of defenses to try to justify those image-heavy posts we see so much of, and I’ve heard all the excuses about why there are 50 photographs but only 30 words of text. I do need to showcase my work, so how else will I do it? Everyone does it this way! Whichever way you look at it, you can’t avoid the fact that your blog posts are there to tell YOUR story as well as the story of your photographs. Sadly, the notion that a picture is worth a thousand words is little more than a pipedream or wishful thinking. It’s up to you to tell the stories, using words, and you know by now, from what I’ve talked about here, it isn’t anywhere near as difficult as you might have imagined. The way to overcome this hurdle is to start with a single image – the one you want to focus your reader’s attention on – and then talk about it at length. Not technical things like the camera, shutter speed, lens, or aperture. But the emotion-evoking elements such as what inspired you to create the image to begin with, what happened before and after the photograph was taken, the events happening outside the frame, and the feelings you experienced at the time. You can also use 2 or 3 other, smaller, images in your post, each accompanied with a caption or, better still, a testimonial from the client, but let the main focus be the story of the main photograph. Think of it like a fireworks display – you don’t want to overdo it and set them all off at once!